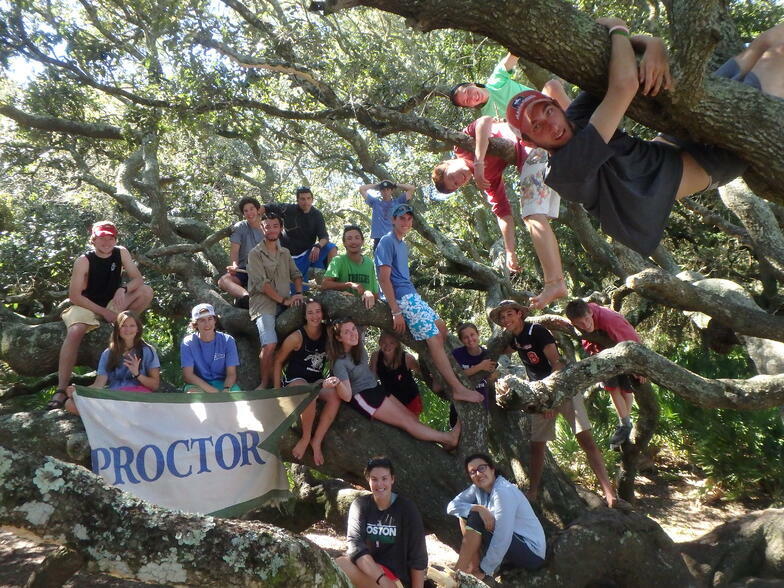 Ocean Classroom has left Charleston, South Carolina with its next stop coming in the Virgin Islands! 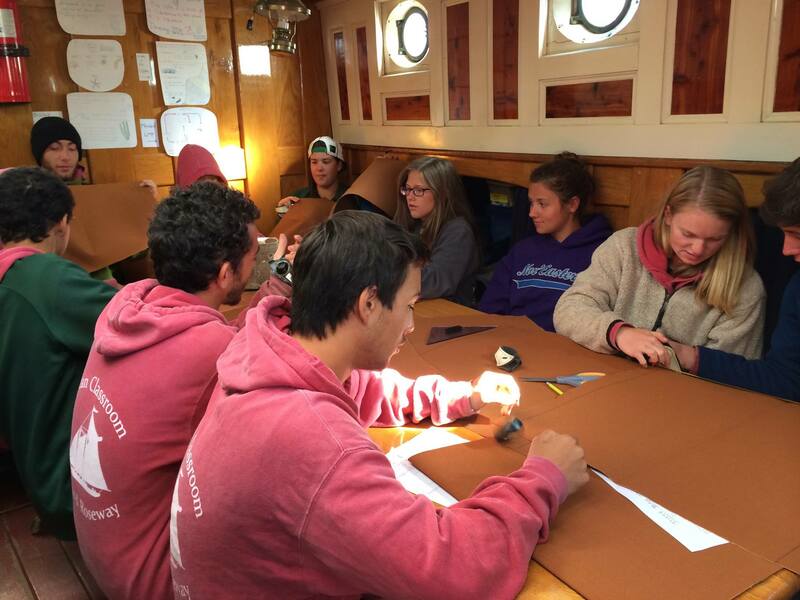 Hurricane Gonzalo impacted the group's itinerary slightly, but as program director Dave Pilla wrote to families Saturday, "Safety trumps everything when at sea." 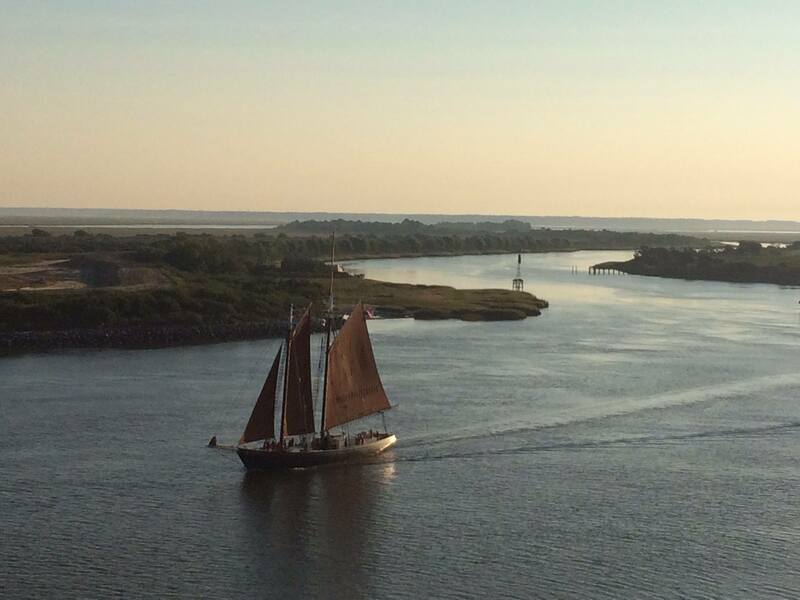 Below, Roseway navigates the Savannah River prior to its stop in Savannah, Georgia. 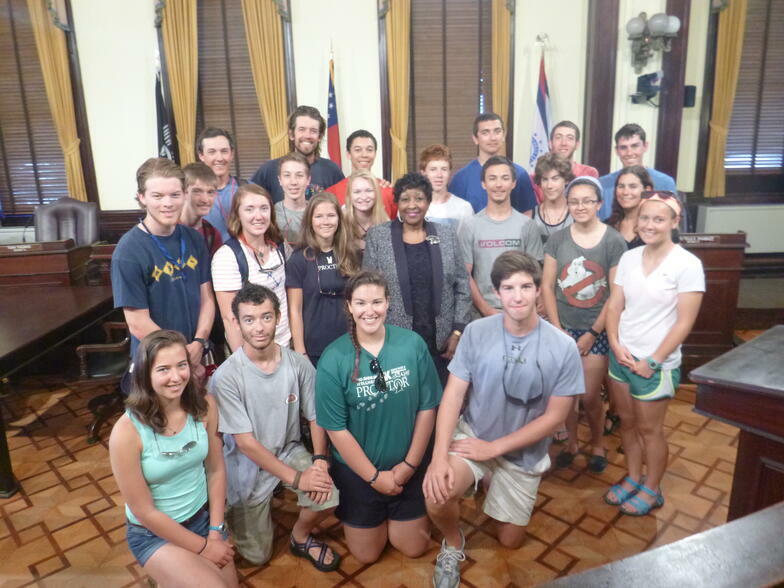 Here's the crew with Mayor Edna Jackson in Savannah, Georgia. A little before the sunset on Friday I was looking out for boats with my bow watch partner and we spotted some dolphins. We went to the rail and watched them swim towards us. Then they turned and started swimming alongside the bow of our boat. They were close enough to our boat that I could have touched them if I had a stick. They were just at the surface and I could see every detail of their speckled bodies through the clear water. They were the North Atlantic Spotted Dolphins, and they were riding our bow wake. They do this because the boat pushes them and they can travel large distances with less effort. It was awesome for us to see dolphins swimming and jumping out of the water up close. There were about seven of them total on both sides of the bow. They stayed with us for half an hour and it was an amazing sight to see. 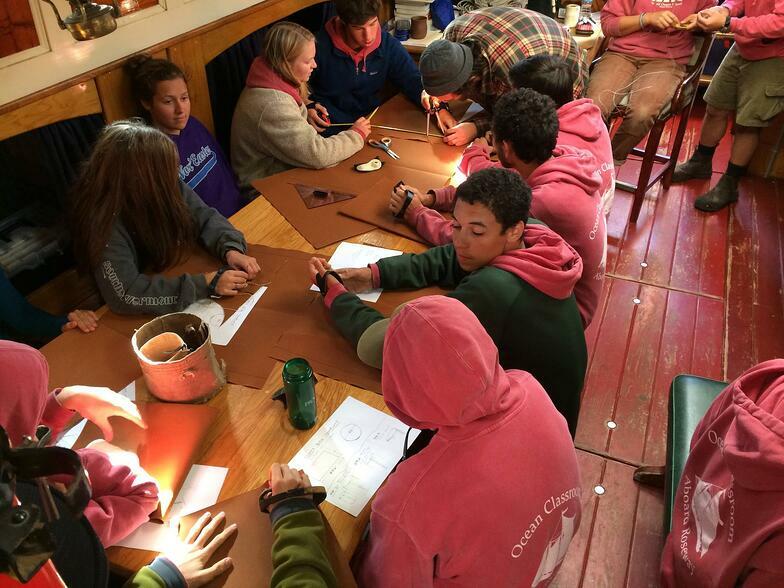 The hardwork of classes in Navigation, Marine Biology and Maritime Literature continue aboard the Roseway. Our last port of call was Cumberland Island off the coast of Georgia. On Tuesday and Wednesday while our friends back at Proctor were in classes, we spent the days exploring this beautiful island. My favorite part was getting to spend time both afternoons playing on the beach and body surfing in the waves. On Tuesday afternoon after we had spent time playing in the waves and enjoying the beach, it was time to return to the ship. During our walk back a thunderstorm rolled in and it started to pour. Rather than trying to hide under our backpacks, we all embraced the rain. Even though we (and all of our stuff) got soaking wet, we all had a fun trek back to the boat because everyone made the most of it. On Wednesday after we took a group picture in a large oak tree, we all donned our bathing suits and headed for the 17.5-mile stretch of white sand beach. As I took my sunglasses off and put my hair back in preparation for a competitive game of capture the flag, I glanced down at my watch and it read 1435 (2:35 for all you land lubbers). Then it hit me…THIS IS SCHOOL. Hundreds of miles North of here, my friends are sitting in classrooms. Here I am chasing fiddler crabs around a marsh trying to pick them up and measure their claws, or I am playing a game of capture the flag and body surfing waves in the 80 degree ocean and it is school! We all really enjoyed getting to spend a few days with Dave Pilla and we were sad to see him leave us. But as we hang out our soaked clothes to dry and pass around pictures taken over the last two days, we get ready for our next adventure: Charleston, South Carolina. All 23 of us crammed into the dimly lit entryway of a closed store. Cars passed by on the busy streets and college students strolled by, staring at us like we were fish in a glass tank. A guitar case lay open out front, welcoming donations for our ice cream fund. The first chord carried throughout the streets, rolling over each passing car and crashing like a wave into the buildings directly across the street. Our melody carried past the busy college kids, and filled the streets of Charleston. One by one, people stopped to look into our little fish bowl. Some occasionally dropping money into our guitar case, some taking videos, some smiling, some dancing, others were rocking to their own individual tune. With each strum of our three guitars, our voices carried further and further in the classic tone deaf harmonies that make the Ocean Classroom choir/band a work in progress. Packing up for the night, we left with $36, a new experience, and our well-earned ice cream feast of drumsticks. A melody still at the edge of our lips, our vocal chords waiting to be strummed once again. Of course, video footage of the Ocean Classroom choir helps tell the story. It's just too bad we're not hearing this chorus ring out from Fenway Park this time of year like we did last fall!